Diplomat Freight Services, an innovative freight transportation services provider based in Annapolis, Maryland, in the U.S., recently handled the shipment of 24,000 plastic buckets from Monrovia, Liberia, to Aqaba, Jordan. A charter broker as well as a freight forwarder, it arranges global charters on a daily basis, Diplomat booked an MD-11 freighter charter to move the consignment on what was an extremely tight shipping schedule. The cargo of 151 pallet-loaded buckets was ready to ship late November 5, and delivery was required by November 8. According to Greg McCloskey, vice president of Diplomat, the flight went off as planned with only a slight delay, and took off from Monrovia at 0530 local time and touched down in Aqaba at 1500 local time. The shipment of 24,000 plastic buckets was delivered on time, even with unforeseen challenges. There was one problem, however, an unforeseen challenge Diplomat had to quickly overcome. "The dimensions provided on this fairly tight build/load were off a little and a decision had to be taken at 0300 local time, by the loadmaster, to remove 78 of the 151 skids (pallets) in use," McCloskey explained, in order for the consignment to fit within the aircraft. 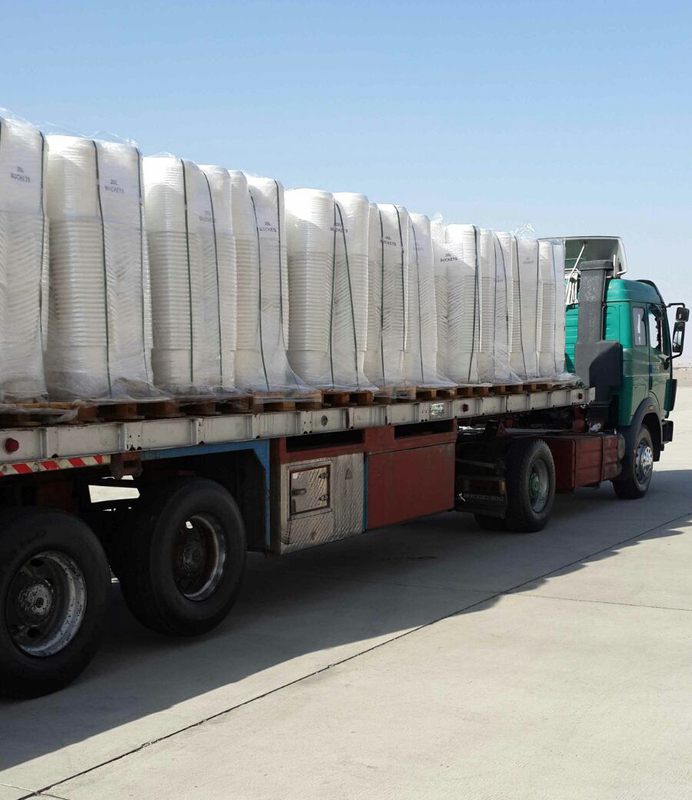 Given that Diplomat had been contracted to deliver all 151 pallets as required for the proper handling of the consignment in Aqaba, a solution had to be quickly found. The answer lay with IFLN colleague and partner SKILL Express Freight. Diplomat had previously arranged with SKILL to arrange the pre-clearance and delivery of the cargo in Jordan. "With the unusual problem at hand of freight sitting on airline pallets in Aqaba without the wooden skids required for final delivery, I graciously asked Osama Kawwa of SKILL for help," McCloskey recounted. SKILL's general manager and partner Osama Kawwa explained how he was able to deal with the emergency so quickly and effectively. "Greg had alerted us to what had transpired, requesting our assistance and support to put things right as quickly as possible. In order for us to load the shipment onto the trailers for delivery to final destination, we had to re-palletize, shrink-wrap and strap the shipment back on to wooden pallets which were not readily available in Aqaba. Also, the flight arrived over a weekend, Friday and Saturday in Jordan, of course, and, with the shipment being time-sensitive and needing to be cleared through Customs as quickly as possible, time was of the essence. "But we managed to send a team on Saturday down to Aqaba from Amman, where SKILL is based, having also simultaneously coordinated with Aqaba Airport management to let them go inside the airport's security/customs zone – not normally accessible to non-airport staff. The team worked all day and overnight until Sunday morning, also fixing an additional 10 pallets which had become loose during the flight. We customs-cleared the shipment, arranged loading onto trailers and safely delivered the consignment intact and in excellent condition exactly as it had been at the point of origin," Kawwa observed. "Without hesitation, Osama and his company jumped into action. SKILL delivered the consignment of 151 skids with cargo on six trucks, in good order without exception, to the consignee on the required delivery date of Sunday November 8," McCloskey enthused. "Osama Kawwa and his team at SKILL in Jordan saved the day, went well beyond the norm to fix a very unusual problem and deliver our cargo on time and without exception. Kudos to SKILL Express and Osama Kawwa," he added. "At all times we worked together in a spirit of good will, teamwork and comradeship," Kawwa reported. "Both Diplomat and SKILL Express Freight worked as one entity within IFLN in order to deliver – together – a first-class service with resulted in the customer's satisfaction. Indeed, the customer said 'Well done, perfect job'!" And what of the skids left behind in Monrovia? They were offered by Diplomat to – and accepted by – the ground handler at Monrovia Airport.